It was again nice and cool in the mountains, for which I remained a bit under clothed. But I slept pretty well on this night after two days of hard riding and there is nothing better then waking up in the woods to the calling of birds. I packed up, cooked breakfast, washed up and got out in a fairly timely manner. As I was riding away there was a loud rubbing sound and I pulled over to find my rear tire flat. Pumping it up did no good, so I returned to camp. This I have to say is the first real flat I may have ever had on the several sets of Schwalbe Marathon Pluses I’ve used. On pulling out the tube I discovered that it had split on a seem. Considering that I transferred this tube over from the last set I had put over 10,000 miles on it’s possible it had just worn out. But still I’ve had no punctures on the Pluses. I replaced the tube and returned to the trail. 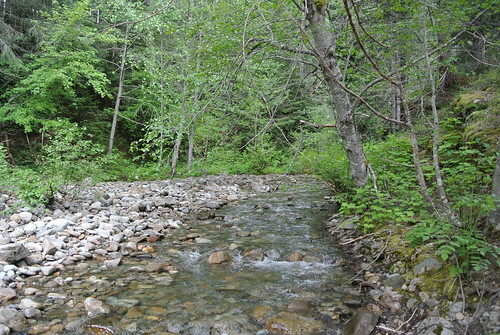 I returned to the trail right above Cold Creek and was in the soft gravel section of the trail. Since there was only about three miles of that, it meant I was back at Hyak in pretty short order. I took advantage of the running water there to wash up better after my tire changing adventure. Again it was mostly clear skies here, but mists were pouring over the mountain indicating that there was plenty of clouds on the west side. There was a lot less people at the trailhead on Memorial Day proper then there was yesterday. 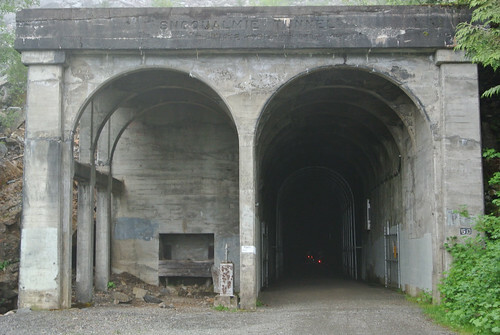 I looked forward to a more sedate trip through the Snoqualmie Tunnel. Since on this day I was heading all the way home, but starting a almost fifteen miles further away I was going to be pushing the whole day to not arrive home to late. But it was also going to be a lot more downhill, including all of my time on the IHT after the tunnel. 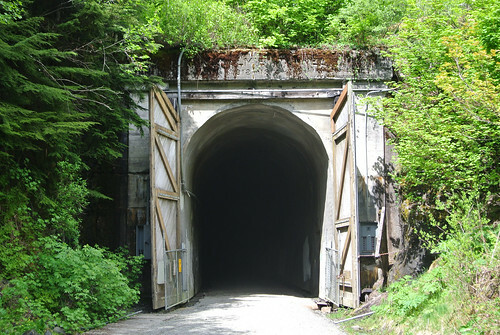 So I didn’t spend much time at Hyak and soon hit the tunnel. There was only a few other travelers making the trek through the tunnel. It seemed to me that there was no point in the two mile stretch where I couldn’t see light from the entrance in my mirror or from the exit ahead. Which I think goes to show just how perfectly straight this tunnel is. On the other side I took off some of my warmer clothes and took in the scene on the western side. There was clouds and mists everywhere, just pouring off the mountain peaks and into the valleys. But looking to the west it was clear it was breaking up. I had about thirty miles to ride on the trail but it was all gently sloped downwards. I pushed it all the way, thinking that I’d try to get to Snoqualmie for lunch. I stopped a few times to take pictures as the mists broke up and more of the surroundings became clearer. It began to warm up a bit, though it mostly a chilly (though not cold) descent. There was a few other people on the trail, but nothing like the day before. Beyond those few photo stops I kept up a good pace on the hard packed gravel trail. It took me less then two hours to make it back to the Cedar Falls trailhead. Once again I rode out to the Environmental Center to take advantage of the water fountains. I hadn’t bothered to filter water back at camp as I had enough left over to make it this far, if I was judicious with my use. That all worked out as planned and after filling up I took back to the trails now following the Upper Snoqualmie Valley Trail into Snoqualmie. Riding on the Snoqualmie Valley Trail in mid-day was definitely a more scenic experience then at dust when I’d come up two days ago. 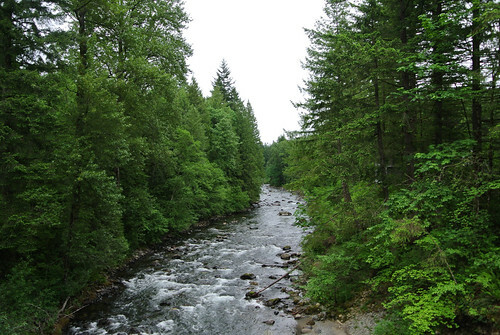 I was able to see into the woods at the various houses, resorts and private camps along the Snoqualmie River and look much further up the rivers at the various crossings. But I was ready for lunch and I stayed on the bicycle most of the time pushing ahead into Snoqualmie. When I arrived in Snoqualmie I decided to return to Snoqualmie Falls Brewery as I’d been pining for another Pre-Prohibition Pilsner. This time I lingered and had lunch as well. I’d made good enough time that I decided that I didn’t have to just push my way home so I rode through Snoqualmie taking pictures of the train graveyard. While I was doing this I heard the short line tourist stream train coming up the tracks and I hastily pulled over and managed to get a shot of the engine just as it steamed past. 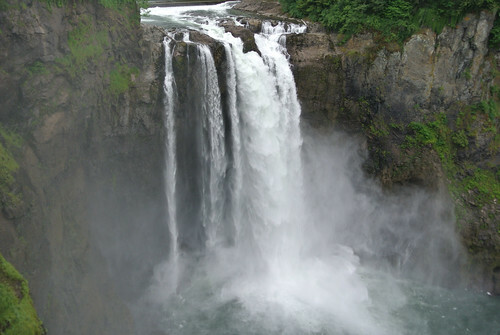 I then decided to head up to Snoqualmie Falls, which I’ve visited often and always enjoy seeing. 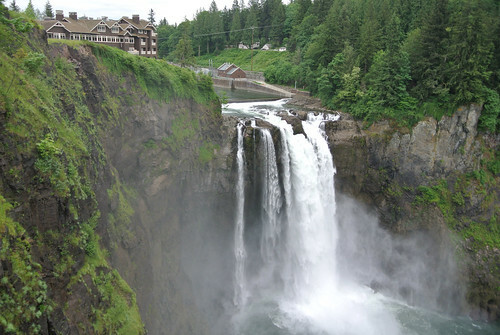 Definitely the premier waterfall close to Seattle not to mention being a prominent feature of Twin Peaks plus the home of the regionally well regarded Salish Lodge means it draws a lot of tourists. So I never linger long, but I always enjoy spending a few minutes gazing into the endlessly cascading sheets of water. After gazing into the hypnotic falls for some time I bought a few postcards, filled up my water bottles and headed out. I took a different route back, which I have to say is definitely the best route to take returning from the area. I rode hwy 207 to Fall City which descending on is a much better deal than climbing up what with all the traffic. This leads to Fall City where I I took the Preston-Fall City Road until I was able to connect with the trails in Preston. 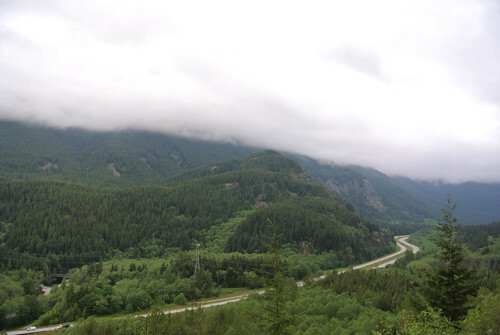 You do climb a bit up to Preston on this route, but nothing compared with climbing up to Snoqualmie Ridge. The road has a wide should and while there is plenty of traffic, it’s fine and you aren’t on it for many miles. Definitely the shortest and least hilly way back. Then it was just taking the various trails back to Seattle: Preston-Snoqualmie Trail, Issaquah-Preston Trail, and the I-90 Trail portion of the Mountains to Sound Greenway. Then it was up the greenway to Beacon Hill and home. I’d made it home by 7pm, still light out and enough time to shower, make dinner and relax a bit before bed. Overall it was a great trip, if much too short. 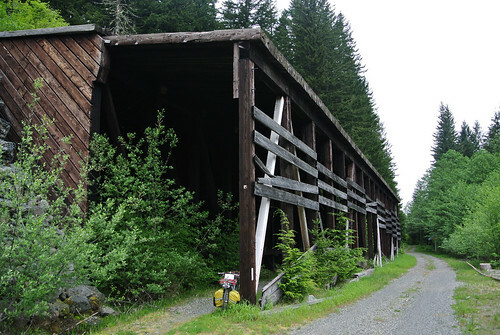 There is so much to explore in the Central Cascades that one could easily spend another 3-4 days there without even riding much further east on the Iron Horse Trail. Cle Elum and Rosyln would provide towns with plenty of breweries, coffee shops, restaurants and grocery stores. 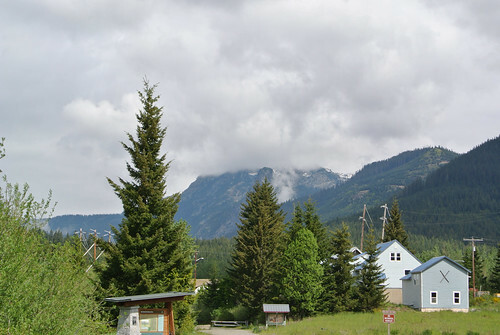 Then there are just endless miles of forest roads to ride around with such attractions as Stampede Pass, Tacoma Pass and the ghost town of Lester. Lake Easton State Park looks like a nice place to stay and check out the lake and I’m sure there was more stuff around Keechelus Lake as well. Then there was just countless hiking trails right off the IHT which I would love to stash the bicycle and spend so time checking out. I know for sure I’ll be back to do more extensive explorations. 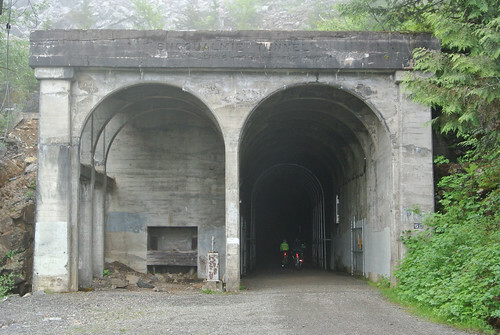 A trio of randonneurs disappearing into the Snoqualmie Tunnel. I awoke to find it damp with streams of mist running down the trail. I made breakfast and broke camp and then walked down to Alice Creek to clean my dishes. A lively creek that ran though trees and over rocks into an aged cement culvert under the trail where it disappeared from my view. As I returned to camp a hiker came up asking me for directions to a side trail, which I had happened to notice the sign for the day before so I was able to help him out. I had to filter water for this day, which with my tiny little hikers Katydyn takes some time. So after all of this it was nearly 11 by the time I left. This was my day solely on the trail so I could take as much time as I wanted, but it would limit how far east I could go. The trail was heavily fogged in, limited the views down onto the I-90, but the ever present white noise of traffic filtered up. It turned out to be a pretty short ride up the trail to the next campground at Carter Creek, which looked nicer than Alice Creek Campground in that the camping sites were right on the river. There was a group of cyclists camped there though, so Alice Creek had that going for it. 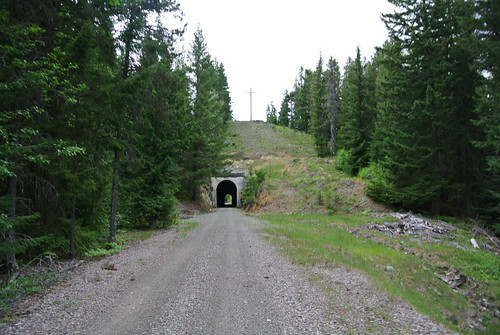 I rode on and not much further on came up the next big landmark on my way up to the tunnel: the avalanche shelter. Back when this was an active railway, it got plenty of snow and there was of course not other route up to these areas. So they built huge wooden shelters that the trains could hunker down in when an avalanche occurred. These were built in the regions were avalanches were common but there is only one remaining at least on this side of the mountains. From the avalanche shelter it was only a few more miles to the Snoqualmie Tunnel. It was still very foggy on this side of the pass by it seemed to be receding a bit. At least I could see more of the slopes surrounding me and the lush greenery that this early warm spring weather has brought. This is my third time riding up to the tunnel, the first time the trail was still covered with snow near the tunnel which hadn’t been opened up for the season. The second time I rode up it was drizzly and cold and I rode through the tunnel after sunset and then turned around and rode home in the dark. This would be the first time that I significantly rode on the east side. 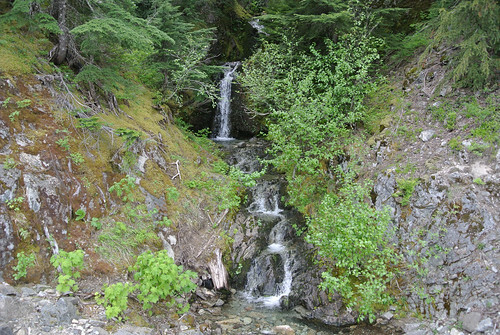 Little waterfall up by the Snoqualmie Tunnel entrance. I reached the tunnel entrance a bit after noon and as I pulled up I there was three randonneur-ish looking cyclists at the entrance. As I passed them one took a look a my bicycle and called out 650 or 700? Somehow I grokked what he was asking (about my wheel size) and replied 700. He immediately lost interest and went back to his preparations. “Cool bike” another one called out. 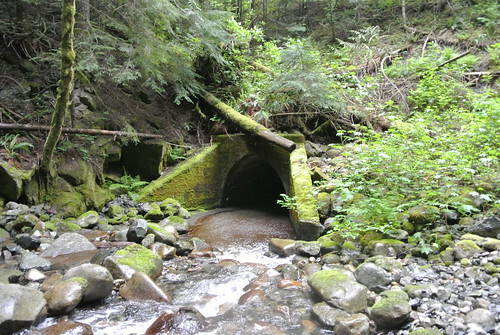 Having ridden though the tunnel before I knew it was refrigerator cold and that icy water could drip on you at points. So I pulled over, took some pics and put on all my rain gear. My generator lights are always on, but I turned on my bright “be seen” handlebar light (which I don’t run on trails normally) and hit the tunnel. The other time I rode through the tunnel it was deep twilight and I only saw a few other people. This time noon-ish on a Saturday during Memorial Day Weekend there were throngs of people. Endless streams of riders, people walking through with no lights, a guy standing right in the middle at the eastern end filming people with his cell phone. It was cold and there was those icy drips of water, but mainly I was happy to get through the tunnel to get away from the crowds. The explanation for the crowds was clear as just a few hundred feet past the east entrance was the Hyak trailhead which was a major destination with a huge parking lot, bathrooms and even showers. The parking lot was packed with people who had driven up to do day hikes or rides. I had lunch at the picnic tables at Hyak, cleaned up in the nice bathrooms and then continued east. I had several options for what to do this day, but since I’d taken a fairly late start I decided that I mainly just wanted to ride as far east as I could. Tentatively I thought I’d ride most of the to Cle Elum and then do a short ~5 miles off the trail to Roslyn for dinner. With that rough plan in mind I returned to the trail. The trail outside of Hyak quickly became very soft and sandy which would persists for about 4 miles. 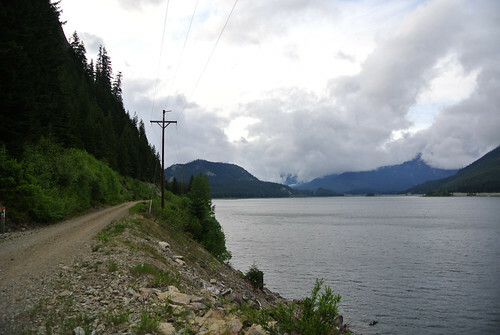 It was quite flat as I rounded Keechelus lake, a large mountain reservoir with a dam at the far eastern end. As I got further from the pass the clouds began to break up and it was warming up a bit. Not far from the end of the lake was the first of the two trailside campgrounds on the east side. The second campground was just another four miles away. The trail had turned back into handpicked gravel and the ride was quite pleasant. Warm, not too hot with clouds and blue skies. I steadily made my way east, stopping to check out the scenery and take photographs. 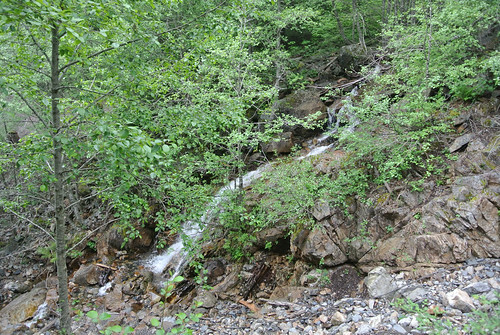 There were little waterfalls off the trail and several river crossings, the most major of which was the Yakima River. Not far past that large river I came upon Lake Easton where you could take a spur trail to Lake Easton State Park. A big state park along the north side of the lake, it was well attended this warm Memorial Day Weekend. If I’d had another day for this trip I would have gotten a campsite and left my camping gear here and done more eastside explorations unloaded. This is definitely a trip I will do another time, as not far from here is a whole network of forest roads that one could explore. 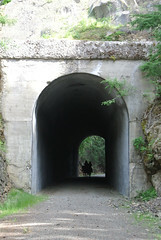 Just past a large trestle that crossed over the southern tip of Lake Easton I came upon another tunnel just as a pair of horse rides came through. Horses on the Iron Horse Trail! I came out of the woods a bit further on and was in the tiny town of Easton. The trailhead just outside of town had good fresh water, one of the few places to get potable water on the trail. I filled my bottles and continued east. I was now in a wide open flat mountain valley and the terrain had shifted to reflect the dryer climate. Dry brown grass, hard scrabble shrubbery, much less undergrowth, well spread out pines and so one. You could smell sage and mesquite every now and again and it was as warm as it would get on this trip. The wind had really picked up as well coming from the west pushing me along the trail. 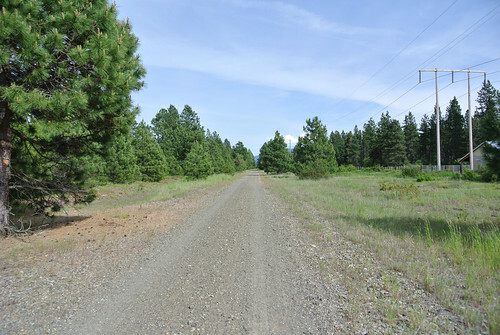 The trail looked like nothing more then a gravel road running along the farmland and through the thin mountain trees. Just a about 5 miles outside of Cle Elum and a mile or so before I’d have to turn off for Roslyn, I decided I had to head back. It was already late in the afternoon and if I rode the ~7 miles to Roslyn and spent any time there I’d wouldn’t be back to even the more eastern campground until dark. I had to ride all the way home the next day and I knew it would be better to make it to the more western campground. So at a road crossing, I paused for a short break and then turned around into the now quite stiff headwind. Riding back to Easton was quite the struggle in this headwind which just added to the gravel trail in creating resistance I had to push against. I was happy to reach the trailhead there and fill up all my water bottles as well as my water bladder for the nights cooking. I consulted Google Maps and rode into Easton and then over to I-90 where I crossed on an overpass and went to a little store attached to a gas station. I picked up a bit of food to supplement my dinner and as I left ran into a Rivendell fan who questioned me a bit about my Atlantis and my ride. From there I rode over to the State park and though it to that spur trail that connected back to the Iron Horse Trail. 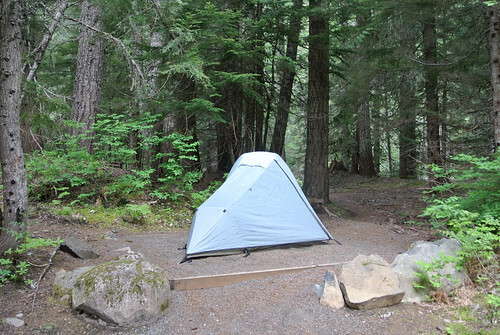 Then it was just a retread of my route to Keechelus Lake and the two trailside campgrounds. Knowing that it’d be easier tomorrow if I pushed it to the second one, I decided this was a good choice as there was a large group at the first one. Four miles up the trail was Cold Creek Campground which I reached just before 8pm in the twilight. There was a family there in the best spot down by the river, but I found a nice spot in the trees and quickly set up and made dinner. As I washed up after dinner I talked to the family a bit, it turned out they had down a similar trip as I did, though they had driven to North Bend where they started out. It was nearly completely dark by the time I had cleaned everything up and put things away. I walked out to look at the lake to see a half moon rising out of the trees. Iron Horse Trail Eastern Side Map. This year I’m not going to be able to do any extended touring, so I’m attempting to make the most of three-day weekends and overnight trips. 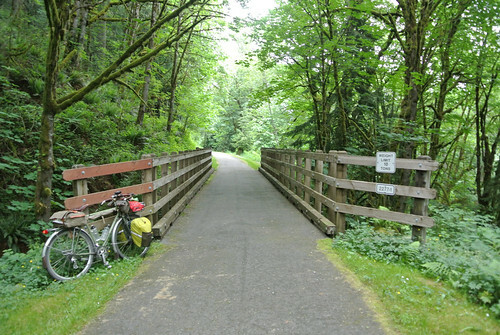 As I’ve noted in these pages it has been quite warm this spring so when Memorial Day Weekend rolled around I finally decided to do a trip I’ve been planning for years: ride a good chunk of the Iron Horse Trail. 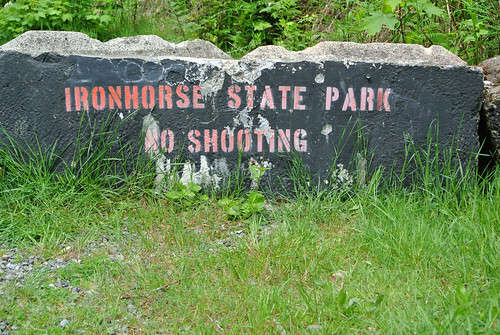 Iron Horse State Park is a narrow park that surrounds the trail which runs from Rattlesnake Lake near North Bend to the Columbia River following the Chicago-Milwaukee-St. Paul-Pacific Railroad. 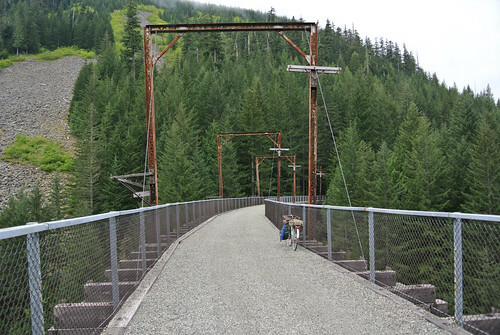 More than 100 miles of trail extends from the trailhead at Cedar Falls to the Columbia River. The railroad of course continues on past the Columbia and so does the trail, though it is not a state park and is run by the DNR. Reportedly it’s quite primitive and more of a horse camping route. I chose to ride to the trailhead though I seriously considered taking the bus to North Bend in order to maximize my time on the trail. 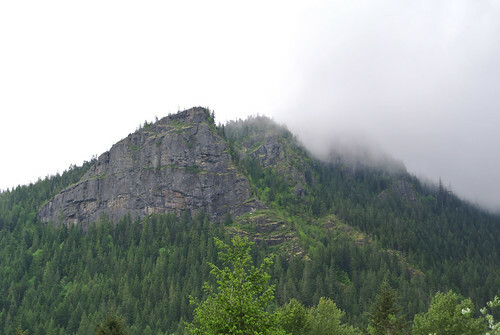 It is a pretty decent journey to North Bend from Seattle with much more up and down and steep climbs then on the trail itself. But if I can ride I like to and in the end I decided that it’d be nice to do some road riding along with the many miles of gravel trail I’d be on (for a recent report on a multi-modal IHT trip, check out this Seattle Bike Blog post: Bus-bike-backpacking on the IHT). As usual I got off a little later than planned, but I still pretty quickly got into touring mode. I followed the usual route following the Mountains to Sound Greenway to Issaquah where I stopped to eat lunch. 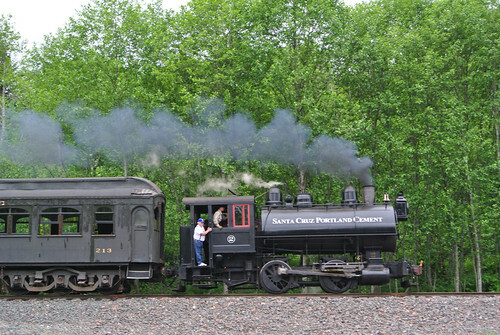 I had packed some sandwiches and I stopped at Issaquah’s Depot Park to eat it. 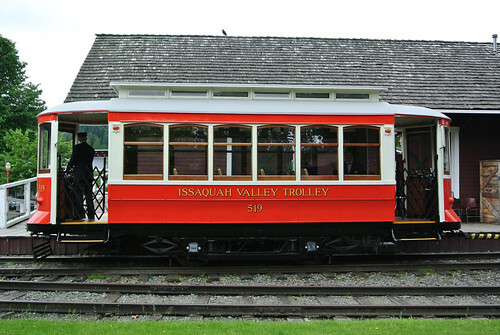 Well while I was there I found the Issaquah Valley Trolley up and running and an art exhibit in the Depot Museum from Shaun Doll that utilized the symbols that hobos used to communicate: Hobos and Homelessness. I didn’t end up riding the trolley, but I did spend some time checking out the art and the railroad exhibits. I’ve encountered hobo signs before in various places and interestingly enough had just been discussing come that had shown up near the Columbia St. onramp in Pioneer square near where I work. From Issaquah I followed the Issaquah-Preston Trail which is a hard packed gravel trail that runs along I-90 to the Preston-Snoqualmie Trail which is paved and heads northeast-ish, both of which I’ve ridden many times. 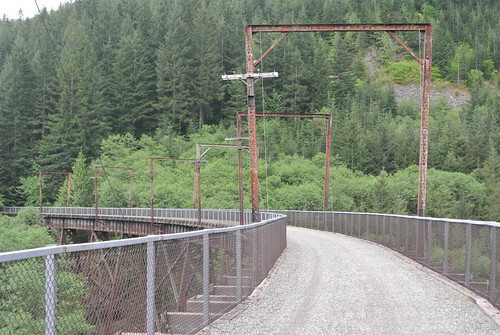 Now the real missing link in the Mountains to Sound Greenway which I’m pretty much following all the way is from this trail to the Upper Snoqualmie Valley trail which connects to the Iron Horse Trail. 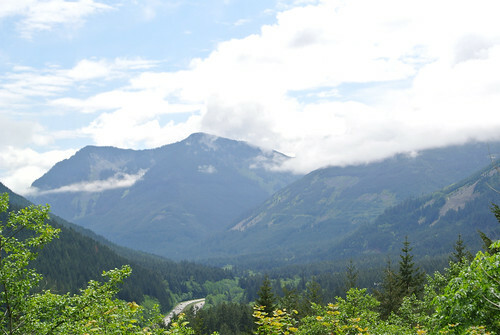 There are basically three options: ride along I-90 for a stretch, descend into the Snoqualmie Valley and take the lower Snoqualmie Valley Trail, or work your way up Snoqualmie Ridge and then into Snoqualmie. The short, but steepest, route is up onto Snoqualmie Ridge and this time Google Maps hooked me up with a route through there. You exit the Preston-Snoqualmie Trail at Alice Lake road and ride the very (very) steep road up to the Lake. The road dead ends around the lake but Google Maps had routed me onto a power line trail the connects to a housing development trail network on Snoqualmie Ridge. It was at this point that I encountered the only real snafu of the day: I went the wrong way on this trail. Google Maps was very ambiguous, with just a Turn left off of the road that I was on. But it curved around and it wasn’t clear whether they were including this curve and then the turn on the trail in which case the direction wasn’t clear. I have a strong sense of direction, but since I’d gone on a winding road up to Lake Alice and then perhaps two-third’s of the way around the lake and I didn’t know what GM was doing, I made the wrong choice. 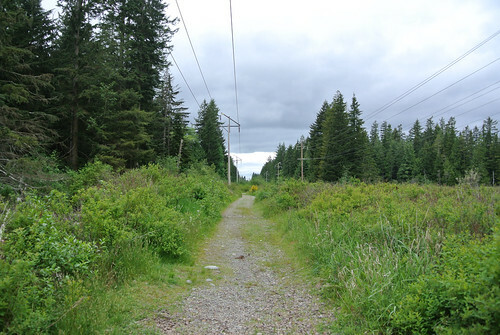 I basically took this power line trail, which became increasingly rough, almost all the way back to where the Preston-Snoqualmie trail crosses the Preston-Fall City Road. At that point I consulted a map app and figured out what I’d done wrong and backtracked. Once I got back to where I should have been it turned out to be less than a mile on this trail before exiting onto the nicely paved Snoqualmie Ridge Trails. 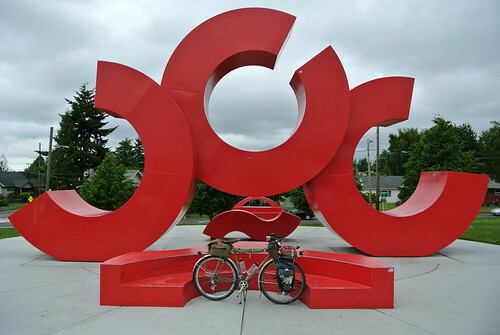 After recuperating at the brewery it was a pretty quick jaunt around Snoqualmie and the backroads to North Bend (home of the Double R) where I connected onto the upper Snoqualme Valley Trail. From here on out I’d be riding on gravel with a very slight grade. It’s nicely hardpacked gravel and that grade is slight, but the combination of the two means that you never make as good of time as you think you would. I was needing to make good time at this point as I was well behind my itinerary due to the late start, the wrong turn and the unplanned stop at the brewery. 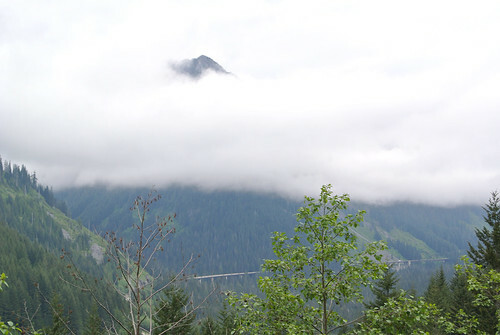 You ride through some far flung suburb’s, cross the Snoqualmie River and then into the woods up to Rattlesnake Lake. 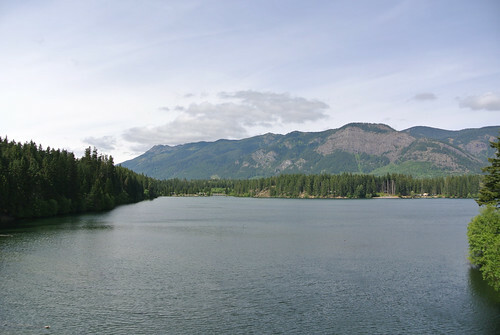 The Cedar Falls Trailhead, the western terminus of the Iron Horse Trail, is on the north edge of Rattlesnake Lake. 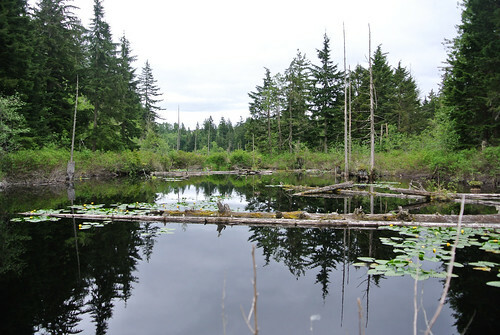 Nearby is the Cedar River Watershed environmental center which is the last tapwater you will find until you are across the pass. 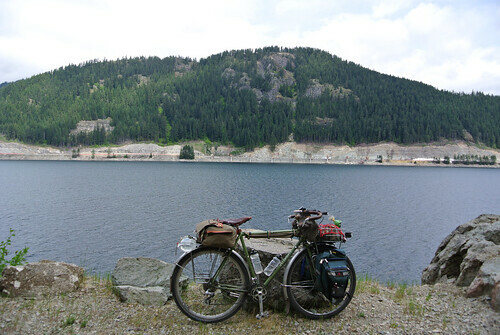 I filled up my bottles, as well as an extra 2-litre bladder and finally set of on the Iron Horse Trail. 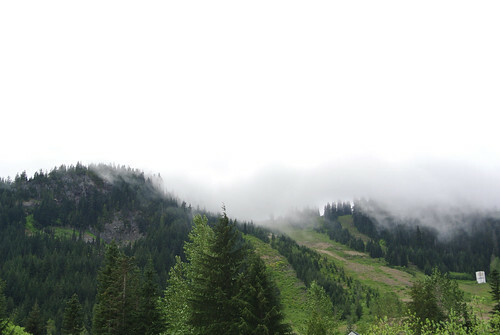 This was an overcast day in contrast to the last few weeks and as I climbed into the mountains I reached into these clouds which streamed down the spring green slopes. The light was dwindling and with few exceptions the remaining people on the trail were all heading west back home. The trail was nicely packed gravel and the large ballast the used to be on all the trestles had been removed and could be found in large piles on either end. Several sections along this first part of the route are shear rock walls that are popular climbing destinations. Most of these were empty at this late hour, though I saw a few climbers heading home. The trail slowly climbs until I-90, which it pretty well parallels, is far below. The wash of traffic though was always present, sometimes more distant, but always in the background. There are four campgrounds, two on either side of the Pass, each pair fairly close to each other. I’d planned to go to the second campground on the western side, to get a jump on the next days ride, but by the time I reached Alice Creek Campground, the westernmost ‘ground, it was late enough I called it a day. 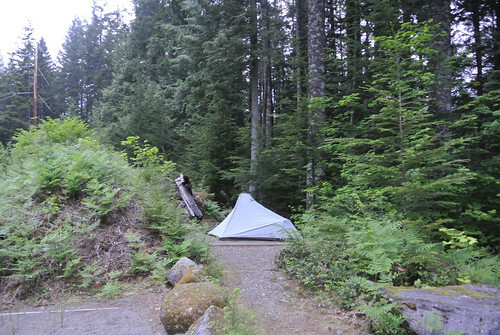 All of the campgrounds are primitive with no running water but are all next to a creek. In this case though it was quite a hike down to Alice Creek. So I did all my cooking and cleanup with the water I had lugged up (and I had lugged up enough for breakfast the next day as well) and as the light truly failed I hung up my food from an old telegraph pole across the trail. I made it into my tent just a bit after 10pm, after a long day.